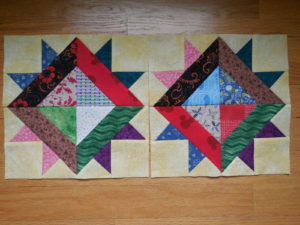 Thanks Angie, for giving us a great block to use up scraps. I love going through my scrap bin and finding a use for them. Some of these calicos are quite ‘vintage’ and some fabrics are fairly new. They all work together in a scrap quilt. This block is not for the slap-dash quilter. It required precise cutting, pinning to make sure pieces came together well, exact scant 1/4 inch seams, and pressing carefully because of bias seams. But it was worth it. I enjoyed making these.